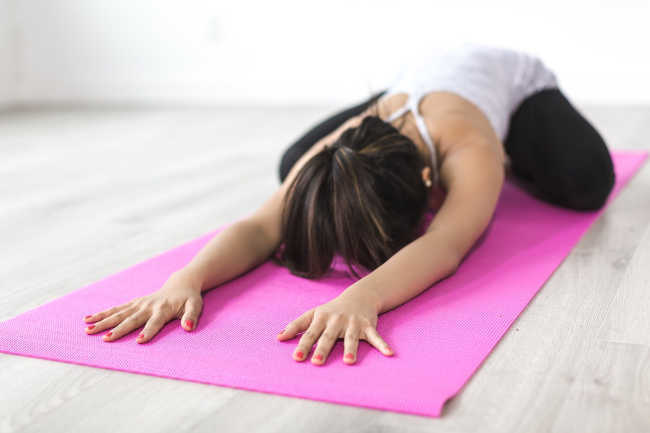 If you’re trying to choose the perfect yoga routine for you – at least for now – it’s important to know which yoga method is right FOR YOU. Before trying out different methods of yoga, it is a good idea to identify your body type. Classical Indian medicine, known as Ayurveda, classifies body types through ‘doshas‘. These doshas consist of air, otherwise known as Vata, fire or Pitta and earth or Kapha. It is through balancing these three qualities that we maintain our health. Practitioners of Indian medicine diagnose patients as being predominantly one dosha, or more usually two. Understanding our doshas can help us to make the right choices when it comes to diet, environment and exercise. Coffee, for example, may act as a beneficial stimulant for someone who is predominantly Kapha while for a predominantly Vata type, coffee overexcites the system. Here is a general outline of the doshas but bear in mind that this is merely a tiny part of what is a vast area of study. Read through the descriptions and decide which dosha is dominant for you so that you can then choose the appropriate method of yoga. Characteristics: Light, slender build. Is enthusiastic and excitable although sometimes restless. Tends to have bursts of energy, moving quickly. Can be a worrier and tends to suffer from changeable moods. Quick to learn but may have problems focusing. Irregular appetite and can be prone to digestive problems. Suggested method of yoga: Viniyoga or Sivananda, both of which are soothing and grounding. Other methods need to be taken gently. This type needs a lot of rest and relaxation. When balanced: A Vata type is happy, imaginative, enthusiastic and alert. Characteristics: Courageous, articulate, intelligent, competitive, can anger easily. Tends to be of medium build and stamina. Loves a challenge and has a sharp intellect. Suggested method of yoga: This type needs calming and all methods of yoga are beneficial. Might be particularly drawn to Astanga because of the challenge but needs to practice it calmly and with gentle breathing. Needs to balance rest and exercise as this type has a sensitive constitution. When balanced: A Pitta type is warm, confident, emotional and content. Characteristics: Can be lazy and has a tendency towards obesity. Has a slow digestion and steady energy. Tends to be tranquil and a heavy sleeper. Is affectionate and forgiving while possessing a solid, powerful build. Suggested method of yoga: Needs to be energized so both Astanga and Iyengar yoga are ideal. Needs regular, demanding exercise. When balanced: Kapha is relaxed, affectionate and calm. To be healthy and balanced, we need the qualities of all three doshas. All of these should be performed with correct breathing.